Jez has long been one of my favorite illustrators, and now he comes up with Dictionary Stories—sentences stolen from dictionaries and pasted together into tiny, delightful narratives. A brilliant literary remix. Dictionary Stories isn’t just a book for word nerds, but for anyone for whom language and story matter. Everybody, A-Z, will find themselves thoroughly in love with this book. The very definition of a folly. Impractical, foolish, and (possibly) unprofitable... yet brilliantly, brazenly fun. Like a cabaret for word lovers. Very short stories composed entirely of example sentences from the dictionary. Available now! Uproarious and ingenious… What sounds like mere novelty turns out to be a revelation in Burrows’s hands, as unlikely sentences generate even more unlikely narratives. Dictionary Stories is a joyful celebration of idiosyncrasy and invention. Spend enough time reading the dictionary and you might begin to notice a strange phenomenon: thousands of oddly conspicuous italicized sentences, all of which read like tiny pieces of fiction that got lost and wandered into the wrong book. 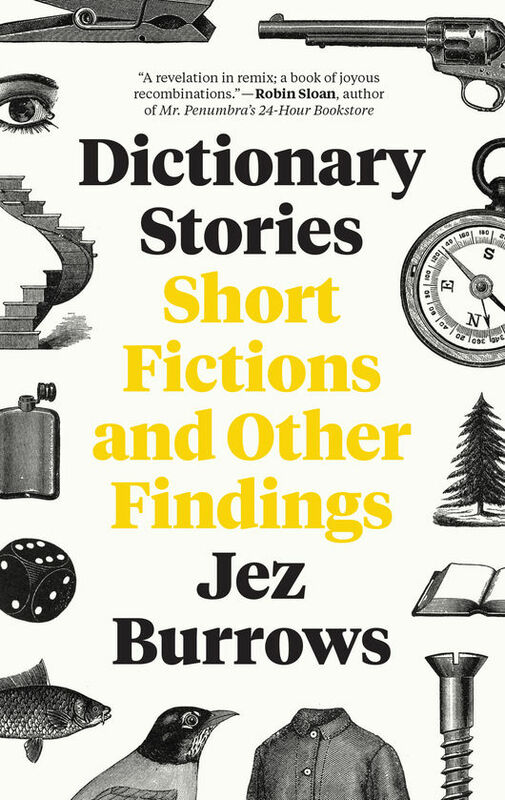 Dictionary Stories: Short Fictions and Other Findings is a collection of very short stories, each composed entirely of these curious excerpts, otherwise known as example sentences. Organised alphabetically by theme from the everyday (dating, family, jealousy, memory) to the extraordinary (the apocalypse, fantasies, murder, the occult), and illustrated in glorious technicolour black and yellow, Dictionary Stories is a giddy celebration of the wild, elastic potential of language. Noir thrillers, fantasy epics, love stories, horror stories, eulogies, recipes, and drawing room murder mysteries—each one a miniature literary remix of unlikely parts hidden in plain sight, created by flipping through the dictionary and knowing where to stop. Sign up to the Dictionary Stories newsletter to receive news and various behind-the-scenes shenanigans before the book's release in April 2018.